I love this anime mainly because I've been playing this game for about a year. If you've played the game you'd love both of the animes. Only anime watchers... well that depends what you're into. If you're a guy who's not into hot anime boys fighting then I don't recommend it. The game itself does not have much of a plot so creating one from scratch was difficult according to the producer. The first two episodes are quite heavy in exposition since they were probably expecting non players of the game to watch this anime. I personally don't mind it since anything will do for me if I can see my sword boys actually animated and moving (lol just me?). The animation-gasm only produced by studio Ufotable will smack you right where it counts in the first episode, which is all the series can be judged by at this time. Will this series fall short of the mark like other Ufotable game adaptations (here's lookin at you Tales of Zestria). Have they learned from their mistakes when it comes to world building and character development resulting in a well paced epic ala Fate/Zero, Fate/Stay Night Unlimited Blade works? We will have to wait and see. Have not played the game so basing this solely on the anime. I loved this! The animation is beautiful, the characters are all likeable, and the storyline is interesting. Yes, there are some holes, like in the story itself, but it's a very likeable anime. PLUS if you love Japanese history of swords and such this will get you all giddy! I sure was every time they introduced a new character (sword). I would like to state : No, I did not play the game before watching the anime. But if you pay attention to all of the little plot clues the anime slowly feeds you, I don't really see a necessity to do so. The animation was the first thing to catch my eye - it's spot on stunning. The art is detailed and colored beautifully, and there are very few scenes that appear rushed and poorly made. If nothing else, it's definitely eye candy. History and time/space traveling, plus sword fights. Right up my alley. I love the plot and idea behind this story, and I think they captured it in a way that is intriguing. And lastly the characters - absolutely precious. I don't care what anybody else says, I adored them all. "Aww man you had to have played the game, which most people haven't, and then you will LOVE this series!" "Oh then naw. It's definitely not good enough to hold up solo." I never played the game, but I really enjoyed this show. It's not going to land with everyone, especially those who require eechi tropes/ little sisters/ fanservice crap in their anime. Feels like it was made for fans of old samurai cinema, so if you need lots of yelling and hijinks this isn't where you should be. Touken Ranbu is about great art, great animation and men wrestling with the concepts of loyalty, comradrery and duty, while remaining true to themselves. The dub version of this is out now. Y'all gonna carry this? I want to own the series but AoA is too expensive for me so it'd be nice if CR carried the dub version of this as well. Great show. One of my favourites. 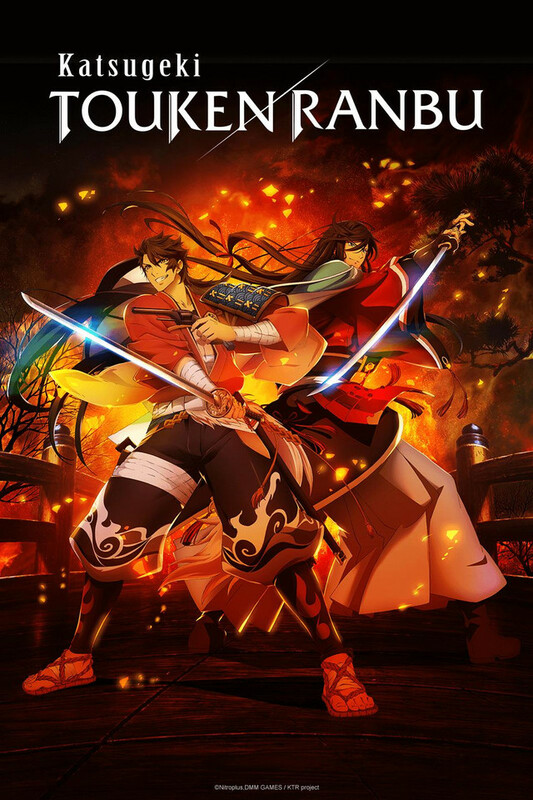 With an amazing animation quality and an epic soundtrack, as expected from ufotable, this anime is definitely worth watching. The plot might be difficult to follow for those who know nothing about the game, but paying attention to the first chapters will be enough. However, if you really want to enjoy the show, I highly recommend watching TR:Hanamaru first (or reading the basics of the game on the Internet). Despite Hanamaru being more of a slice-of-life anime, and the stories set in different timelines, watching it before Katsugeki will help you to get familiar with the characters. I thought the animation was good at first, and I really liked how the characters seemed to be more in-depth than the Hanamaru series... but it was just a cascade of angst for the characters with no sort of resolution or anything in sight. Just a show about pretty boys being emo about themselves an each other.